The French skin care line Payot Homme is A-list jet set skin care at it’s best. More private Gulfstream 550 than seat 38B economy on Delta. I’m imagining Hollywood leading glamour men like George Clooney, Daniel Craig and Hugh Jackman being drawn to Payot Homme. The Payot Homme line is called OPTIMALE and there’s a certain understated elegance about these products that I love. They smell rich and perform in a smooth no fuss manner. 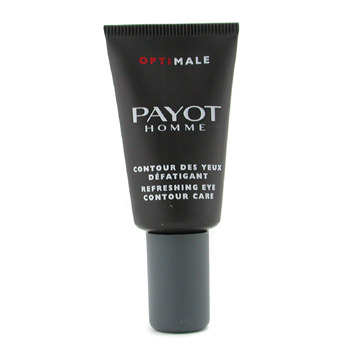 The first product I got hooked on was Payot Homme Refreshing Eye Contour Care. It does an excellent job in reducing dark circles & puffiness from my under eye area. Thumbs up for it’s hydrating, protecting & smoothing effect on the eye zone. Leaves my skin feeling stronger. It also helps eliminate the appearance of fine lines & wrinkles. I’m giving Payot eye cream extra bonus points for its light-reflecting pigments — they minimize the signs of fatigue and I noticed this on the first application. Next on my bathroom sink is Payot Homme Energizing Care moisturizer. This is an excellent moisturizer — not greasy at all. Long lasting moisture with a very nice refreshing masculine scent. Great as an aftershave and highly recommended. I recently read on Twitter that one of the guys from the TV show Heroes LOVES Payot Homme moisturizer. I wonder who he is!!! They all have phenomenal skin. Payot Homme is on my Hot List. Ever look in the mirror and think, "Not bad, but I could really stand to be Adam Lambert a little?" you too can finally achieve the look that's enchanted a nation! Guapostore offers the best male cosmetics market: exclusive brands for men, moisturizing, firming, scrubs, facial masks and more. Do not miss the chance to get cute with Guapostore. This will give you perfect skin every day of your life. Men have larger pores that can absorb more grimes and dust during a day; so, a face cleanser that was designed for women is simply not strong enough to completely cleanse men's skin. Men have 20% thicker skin than a women, means that men really need specially formulated moisturizers and cleansers to maintain healthy skin. Guapostore te ofrece lo mejor del mercado en cosmética masculina: marcas exclusivas para hombres, hidratantes, reafirmantes, exfoliantes, mascarillas faciales y mucho más. No te pierdes la oportunidad de ponerte guapo con Guapostore. Así tendrás una piel perfecta cada día de tu vida. Dado que el acné es un tema muy caliente en el mundo del cuidado natural de la piel haya muchas posibilidades de muchos remedios del acné, ya que hay curas para el hipo. La razón de que existen tantas, y que la mayoría de ellos son jurada de acuerdo a sus creadores es que todos los casos de acné es diferente. Encontrar el equilibrio adecuado para la piel de un individuo suele ser la verdadera clave para mantenerse libre de acné. Esto puede ser especialmente difícil para los adolescentes, ya que su química del cuerpo está cambiando constantemente.